Center Of The Milky Way Has Thousands Of Black Holes, Study Shows : The Two-Way The supermassive black hole lurking at the center of our galaxy appears to have a lot of company, according to a new study that suggests the monster is surrounded by about 10,000 other black holes. 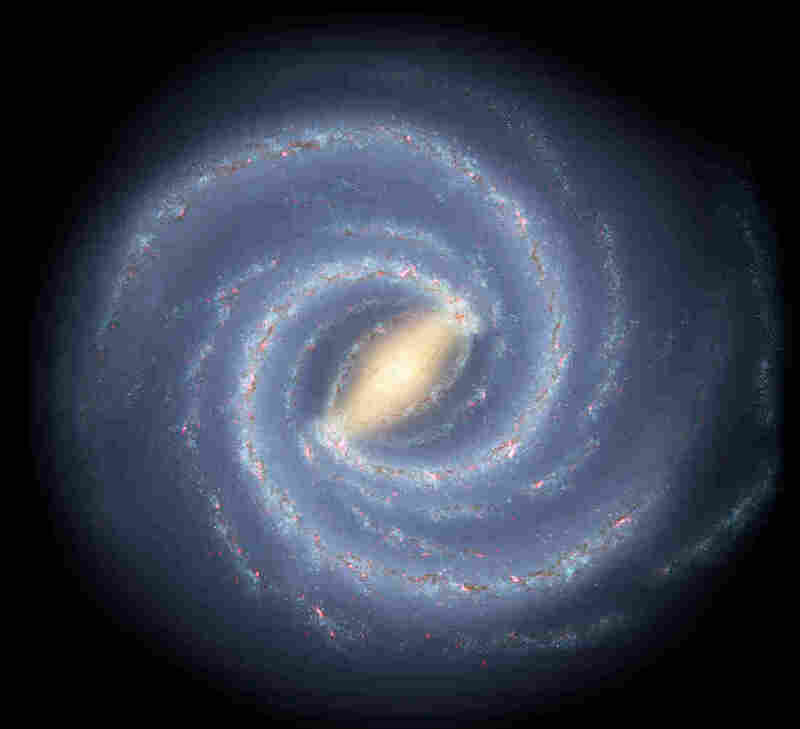 An artist's rendering shows the Milky Way where a supermassive black hole lies at the center. A dozen smaller black holes have now been detected, and a new study suggests the monster is surrounded by about 10,000. The supermassive black hole lurking at the center of our galaxy appears to have a lot of company, according to a new study that suggests the monster is surrounded by about 10,000 other black holes. For decades, scientists have thought that black holes should sink to the center of galaxies and accumulate there, says Chuck Hailey, an astrophysicist at Columbia University. But scientists had no proof that these exotic objects had actually gathered together in the center of the Milky Way. "This is just kind of astonishing that you could have a prediction for such a large number of objects and not find any evidence for them," Hailey says. He and his colleagues recently went hunting for black holes, using observations of the galactic center made by a NASA telescope called the Chandra X-ray Observatory. Isolated black holes are almost impossible to detect, but black holes that have a companion — an orbiting star — interact with that star in ways that allow the pair to be spotted by telltale X-ray emissions. The team searched for those signals in a region stretching about three light-years out from our galaxy's central supermassive black hole. "So we're looking at the very, very, very center of our galaxy. It's a place that's filled with a huge amount of gas and dust, and it's jammed with a huge number of stars," Hailey says. What they found there: a dozen black holes paired up with stars, according to a report in the journal Nature. What's more, the very center of our galaxy surely has far more than these dozen black holes that were just detected. The researchers used what's known about black holes to extrapolate from what they saw to what they couldn't see. Their calculations show that there must be several hundred more black holes paired with stars in the galactic center, and about 10,000 isolated black holes. "I think this is a really intriguing result," says Fiona Harrison, an astrophysicist at Caltech. She cautions that there are a lot of uncertainties and the team has found just a small number of X-ray sources, "but they have the right distribution and the right characteristics to be a tracer of this otherwise completely hidden population." "I find black holes really cool," Hailey says. "Finding large numbers of black holes is just really neat because it's just a larger population to study. These are really exotic objects. The more that you can have of them, the more fun you can have studying them." He thinks what they've found should help theorists make better predictions about how many cosmic smashups might occur and generate detectable gravitational waves. Scientists have only recently started to detect these ripples in space-time, which were predicted by Albert Einstein about a century ago.